The idea of celebrating Jesus' birth was done to counteract pagan holidays celebrated in Rome during the Winter Solstice. Church leaders thought Christmas celebrations were more likely to be popular if they coincided with the traditional festivals and merrymaking during the Winter Solstice. Although some Christmas celebrations are secular, the religious aspect of Christmas remains central to celebrations. This is evident in church services such as Midnight Mass and primarily in the many forms of the Nativity, or Christmas Story, presented wherever people celebrate Christmas. That story started in Nazareth in Galilee about two thousand years ago. Mary, a young woman, was engaged to a carpenter named Joseph. An angel appeared to her one day and told her she was with child. She couldn't understand how that could happen because due to her circumspect nature, she had not laid in bed with Joseph. The angel explained however, that the child would be special as he would be the Son of God and his name was to be Jesus. Mary and Joseph then got married soon after the angel's appearance.. But about the time when Mary was to have the baby, the couple had to travel far away to Bethlehem, Joseph's birthplace, to pay a special tax. It was difficult for them to find a place to stay because many other people were in Bethlehem to pay their taxes. After many rejections, one innkeeper offered a room in his stable where they could spend the night. That's where Jesus, the Holy Child and Son of God was born and then wrapped in bundles of cloth and placed in a manger for a cradle. In the same hours that Mary was giving birth, shepherds who were in a field that overlooked Bethlehem saw an extremely bright star over the sky in Bethlehem. They had never seen anything like it and had feelings of curiosity and scariness. An angel appeared and told them the 'good news' that the Son of God had been born in Bethlehem. The shepherds left their flocks to go to Bethlehem to find the baby. When they reached the stable, they were filled with immense joy at seeing Jesus. They fell to their knees and worshipped Him. They also told Mary and Joseph about the bright star and the angel appearing to say Jesus would be the Saviour of the world. The bright star was also seen by Wise Men in the east. The Wise Men, who studied the stars, learned that a new and great ruler would appear whenever an extraordinarily bright star appeared in the sky. Three of them therefore set out to find the new ruler. They first visited King Herod in Jerusalem because they thought the child would be born in the palace. But when they asked to see the child who would be the new ruler, King Herod was very worried as he thought he would be removed from the throne. King Herod told the Wise Men that when they found the baby, they should return and tell him so that he could also worship the baby. The Wise Men used the star as a guide to go to Bethlehem where they found Mary, Joseph and Baby Jesus who they worshipped and offered gifts of gold, frankincense and myrrh. The Wise Men are celebrated in some Christmas celebrations on Jan. 6, known as the Epiphany to mark the date when they found Jesus. Later in the night the three Wise Men had a dream in which an angel told them that King Herod wanted to kill Baby Jesus. They left Bethlehem to return to the East but didn't return to Jerusalem to tell King Herod where they had found the child. Joseph also had a dream soon after the Wise Men left in which an angel appeared and told him to take Mary and Jesus to Egypt because Herod had ordered that Jesus be killed. 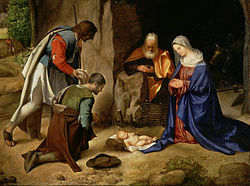 In an effort to kill Jesus after the Wise Men did not return to inform him of the baby's whereabouts, Herod later ordered that all baby boys in Bethlehem should be killed. But by then Mary and Joseph had left with Baby Jesus.